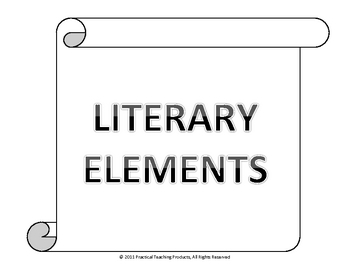 In our reading class we use the Literary Elements booklet as a whole group project. After reading the story together, the teacher guides the students as they discuss the meanings of the literary elements, and helps the students fill out the charts for the setting (RL.4.3), characterization (RL.4.3), protagonist, antagonist, theme (RL.4.2), point of view (RL.4.6), plot (RL.4.3), conflict/problem (RI.4.5), foreshadowing, flashback, climax, and resolution/solution (RI.4.3). Each day we read another book and continue the process of discussion and completion of the booklet. The students often like to add illustrations. The books we use are The True Story of the 3 Little Pigs! by Jon Scieszka, The Three Little Wolves and the Big Bad Pig by Eugene Trivizas, Yeh-Shen by Ai-Ling Louie, and Mufaro's Beautiful Daughters by John Steptoe. The books are not included. Each of these books are 'AR' (Accelerated Reader) books. 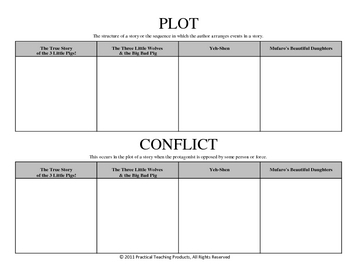 You can also compare and contrast the books through oral discussion or by using a Venn diagram, assess how the point of view or purpose shape the content and style of a text (R.CCR.6). 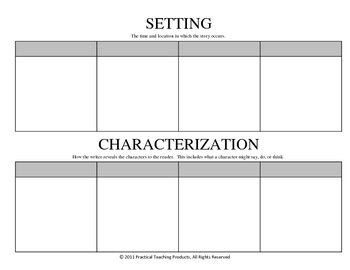 I have added pages with blank boxes in case you would prefer to use other books or stories than the ones suggested. Thank you for your interest!